Building vocabulary is key to helping children make sense of the words they are reading. Learning new words starts when babies are born and continues throughout life. A strong vocabulary helps to increase a child’s chance for academic success. 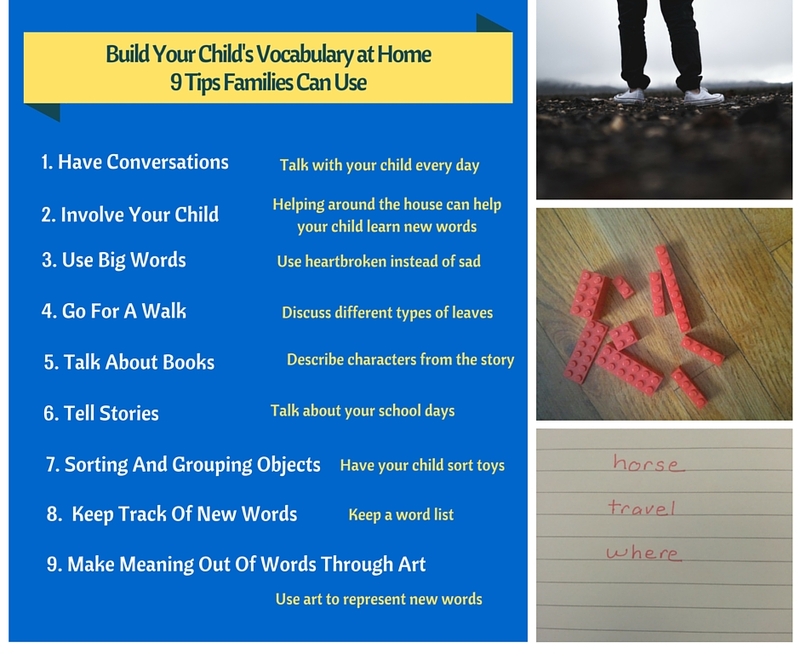 Below you will find 9 tips families can use at home to build a young reader’s vocabulary. Talk with your child every day. By talking and listening, your child will build oral language and vocabulary. Example: Talk about your child’s school day. Ask her to describe the highs and lows of her day at school. Prompt her to explain details of what happened, how she felt, and the ways her classmates or teacher reacted. Cooking, gardening, or other activities around the house provide opportunities for children to learn new vocabulary words. Example: If your child is helping make cookies, you can introduce cooking terms (measure, cups, teaspoons, etc.) while showing him what the words mean. You don’t always have to use “easy” words when speaking with your child. Show him there are different, fancier ways of saying words he already knows. The great outdoors provide many opportunities for children to discover and learn. Going for a simple walk around your neighborhood can help your child learn and use new words. Example: Point out different vehicles you might see. You can discuss types of cars, different sizes (mini, large, humongous), or the purpose of each type of vehicle (delivery vehicle, bus, ambulance, family vehicle). While reading with your child, make sure to discuss the story. Example: Use a variety of words to describe characters or events from the story. If your child comes to a new word, talk about the meaning and try to explain it in a way your child can understand. Telling stories is an engaging way to get your child talking and asking questions, which is also strengthening her vocabulary. Example: Tell your child about when you were young. Talk about trips you might have taken or how school might have been different when you were young. By putting objects in groups, children can learn new words that label the category. You also can discuss the ways in which items in the groups are similar or different. Toys are great for sorting and grouping. Example: Ask your child to group a set of toys by color. Next, ask him to arrange the toys by size. Other examples include sorting clothing for the laundry or items in your recycling bin. Ask what the items have in common, what he would name the groups, and how he would tell the groups apart. Help your child be aware of learning new words, by keeping track of them at home. Example: One way to keep track of words is to keep a running list of them. You might do this by creating a word wall at home. Simply write new words on index cards and display them on a wall in your home where you are likely to see them often and be reminded to use them when talking with your child. Use drawing, painting, or acting to help your child learn new words. Example: Have your child create a drawing to represent a new word she has learned. Also, have your child act out the meaning of the word. These are fun ways to help your child remember new words. Building vocabulary is critical to your child’s reading success. You can use these 9 tips to help your child learn new words in fun and easy ways.